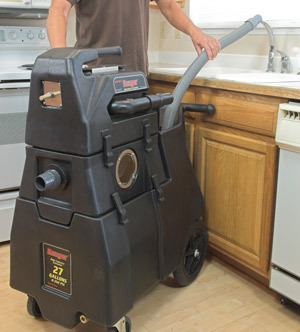 The Rotovac Ranger is about the same total size as the typical twelve gallon moveable extractor. The HUGE difference is actually its ultra large twenty seven gallon ultra large twenty seven gallon of clean water container that has a detachable “Extractor Pod” (Pump-Out Unit). This makes the user able to clean for an extended amount of time more than twice as long as the common extractor machine without the need of stopping and refill. The Ranger’s exceptional modular style enables the Extractor Pod for being simply taken off the lower twenty seven gallon holding container for quick loading & unloading from car or truck (two 40 lb modules instead of a single 80 lb unit). 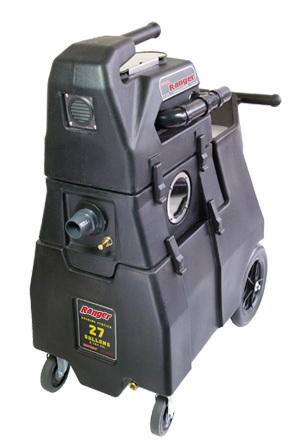 The Extractor Pod could as well be utilized minus the 27 gallon container for direct faucet hook-up non stop cleaning function. 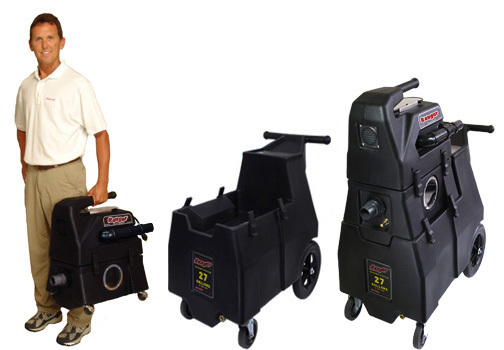 The Ranger can clean non-stop for more than twice as long as a standard 12 gallon extractor!